BOTOX® Cosmetic and Xeomin are very popular injectable treatments that relax the muscles causing wrinkles in the face. But did you know these can also be used to treat a gummy smile like the patient above? The ‘before’ is on the left the after is on the ‘right.’ Thanks to this lovely patient for sharing her selfies with us! When a person smiles, the upper lip naturally raises up. Depending on your anatomy, this can reveal more upper gums than you’re comfortable with. You can surgically reduce the height of your upper jaw. However, that requires major surgery and breaking facial bones. Not a decision to be taken lightly. With a non-surgical treatment, BOTOX® Cosmetic or Xeomin can accomplish the same goal. By injecting these products into the upper lip, it relaxes the muscles that normally pull the upper lip high enough to see the upper gums. 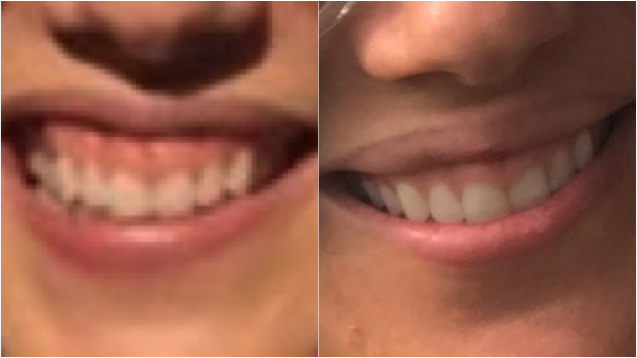 When the lip “excursion” is less, less gums are seen. That’s how you treat a gummy smile. Obviously the surgical treatment would be more permanent whereas you have to repeat the injections every 3-6 months. That decision is up to you. In the meantime, you can check pricing on this procedure from Dr. Kaplan here.